Astrological & Vaastu based Diagnosis and Reiki Healing and other Remedies based on Indian Vedic System, Jainism, Buddhism, Universal Energy based systems etc. Why Vaastu nowadays does not work? Why do astrology remedies do not give results? Astrology Secrets hidden by most astrologers. Real Life example of Astro-Vaastu combination which helped a childless couple. Sequel to The Myth and fallacy of East facing houses and shops for success and happiness. The Myth and fallacy of East facing houses and shops for success and happiness. Are we really staring at a war with China? How to profit from the stock markets / commodity trading / regular business and day to day life. Do you or your wife have Mangal Dosha? Jupiter the most beneficial planet moves into Kanya rashi (Virgo Sign) on 12th August 2016, know what is in store for you till 13th September 2017. Karma – How and why does it work? Rikhav Khimasia started practicing as a Professional Consultant Astrologer and Alternative Healer, from early 2000 AD at the age of 28. It was May 2003 when he was approached by people representing one of India’s foremost Parsi Astrologer’s website and was taken on board as a Team Member in the position of a Senior Web Astrologer. In his tenure on this website he has had the fortune of reading, interpreting and replying to more than 30,000 horoscopes, till he resigned in June 2009. Rikhav Khimasia, has a detailed experience in dealing with issues like, child birth, marriage, love, business and career choices, education choices, Mahurats of all kinds for all kinds of purposes, fortunate days and many more. An astrologer Par Excellence, Rikhav Khimasia had predicted on many things like Chandrayaan Mission and its untimely demise, the Large Hadron Collider and its need to take a break soon after its start, on Man Mohan Singh becoming the PM again in the 15th Lok Sabha, on Nano moving to Gujarat, on many other Indian and Western celebrities, on TV shows like Dus Ka Dum and on new entertainment channels like Colors and its TRP growth, and many more; all in form of articles on the net, which may still be found. Rikhav Khimasia is a Management Graduate, and has learnt Vaastu, Reiki, Crystal Healing, Pyramid Vaastu, Transcendental Meditation, Auto Suggestion, Self Hypnotism, Past Life Regression, Alpha Beta Theta level Meditation too. He is versatile with use of various techniques and does not stick to a single technique or school of astrology as he believes in the Motto “Solve Client’s Problem Any How”. He is not at all loyal to a single technique or school of astrology, he is only loyal to his client. The other advantage being, that he can bring in and attach age old astrology rules and significations to the current modern times and not be bogged down by the lineage and ancestry. He is secular by nature and believes GOD is one. Transiting Ketu is passing through his tenth house of career and productivity. This is not a good sign at all. Ganesha fears that he may not be able to play well. The saving grace is there, which is in the form of transiting Shani trine to his natal Moon the lord of his tenth house. This will save him from a worthless play to at least cautious and disciplined. 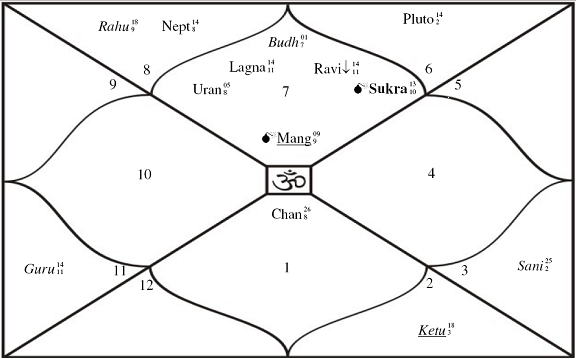 As per the Solar Arc Mars – Pluto axis will be in force in 2009. This will be an added support. Ganesha thus finally feels that he will play better than average. Wishing him a progressive productive 2009. To seek his Services in Astrology, Vaastu, Reiki, Healing, Healing Products, Remedies you may visit the Services Page @ Services and Fees on this site and liberate yourself from your Karmic burden.